A research group led by Prof. LIU Shengzhong from the Dalian Institute of Chemical Physics (DICP) of the Chinese Academy of Sciences, in collaboration with Prof. YANG Dong from Shaanxi Normal University and Prof. Shashank Priya from Virginia Tech, studied the high efficiency of planar-type perovskite solar cells with negligible hysteresis using EDTA-complexed SnO2. Their findings were published in Nature Communications. The planar-type perovskite solar cell has recently received great attentions due to simple device structure and easy fabrication process. However, its efficiency is still lower compared to mesoporous architecture. Furthermore, the planar-type perovskite solar cells exhibit severe hysteresis. In their previous work, LIU’s group used ionic liquid to modify TiO2 electron transport material, and the efficiency of planar-type perovskite solar cell was up to 19.62% with reduced hysteresis, the highest efficiency at that time for planar-type perovskite solar cells. Recently, they employed ethylene diamine tetraacetic acid (EDTA) to complex SnO2 to fabricate the E-SnO2 electron transport material with excellent photoelectric properties. "We improved the efficiency of planar-type perovskite solar cells based on E-SnO2 increases to as high as 21.60% (certified efficiency at 21.52%), which is the highest efficiency for planar-type perovskite solar cells to date," said LIU. 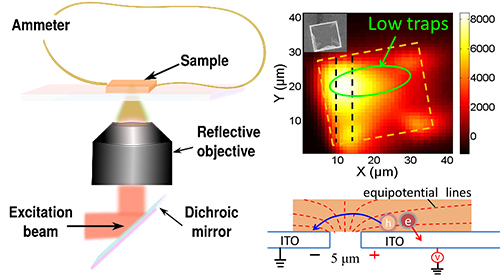 The researchers revealed that the high electron mobility and suitable energy level of E-SnO2 could effective suppress the charge accumulation at electron transport layer/perovskite interface, which was caused by ion migration and unbalance transport between electrons and holes, leading to negligible hysteresis. 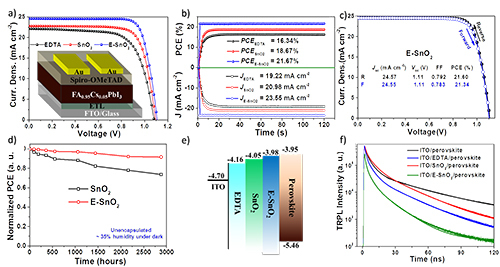 Moreover, the perovskite degradation at grain boundary was efficient suppressed owing to larger crystal grains of the perovskite absorber when deposited on E-SnO2, resulting in good long-term environmental stability of planar-type perovskite solar cells. 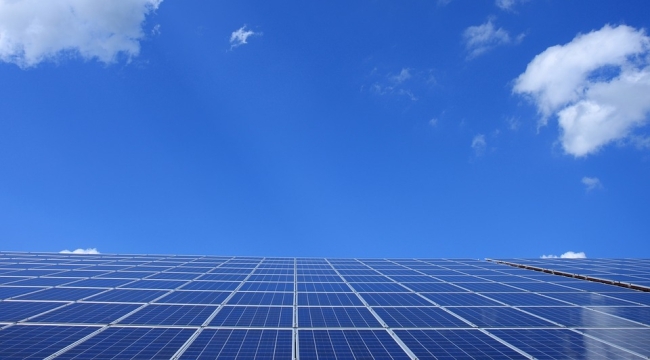 Their results will provide a promising pathway for high performance of planar-type perovskite solar cells. The research was supported by the National Key Research and Development Program of China, National Natural Science Foundation of China, National University Research Fund, the 111 Project, and the Chinese National 1000 Talents Plan program.